When I was asked to try Vanilla Chex, I had some reservations. Would it be any good? I did agree and was sent complimentary boxes to try. When I received the cereal, I grabbed a handful. Some had a visible frosting, but not all. With the mixture, it wasn't too sweet and had a nice vanilla flavor. It is gluten-free and contains 10 grams of whole grain per serving. And as far as a sweetened cereal goes, it is pretty low in sugar--just 8 grams per serving. It also only has 120 calories per serving. The family likes it, too! I noticed the recipe on the side of the box for Vanilla Muddy Buddies and decided to give it a try since I love the regular Muddy Buddy recipe. Mixing it up with the white chocolate was a little more challenging than mixing regular muddy buddies since it was hard to tell if all the pieces were coated (see photo). Since I think white chocolate is sweeter tasting than chocolate, I cut back on the confectioners sugar. I took the mixture to a family part and it was a hit! A couple people did note how sweet it was despite the cut in confectioners sugars. The majority, though, loved it! My nephew, who doesn't eat chocolate (something is wrong with that boy) really loves it! I promised to make him more next time we get together. I think this is a perfect recipe for the holidays--why not toss in some red and green M&Ms or some snowflake sprinkles to make it look more festive? I may make individual serving packets in clear baggies with a big white bow to use as party favors or pass out as special treats to my friends. Another idea I had for this was to add craisins to the mix. It would make it super festive and I think the craisins would really go well with the white chocolate and vanilla flavoring. If you decide to try Vanilla Chex, let me know how you like it! Disclosure: I was provided sample boxes of cereal in exchange for my honest opinions. I was not compensated for this post. This looks super yummy! I like super easy snacks that taste good. The kids would like this! Thanks for sharing this recipe will have to try them out at our next holiday gathering. Woot!! love vanilla, there are so many possibilities to add to to the vanilla flavor. This is so simple, and the white makes it very festive for a holiday treat. 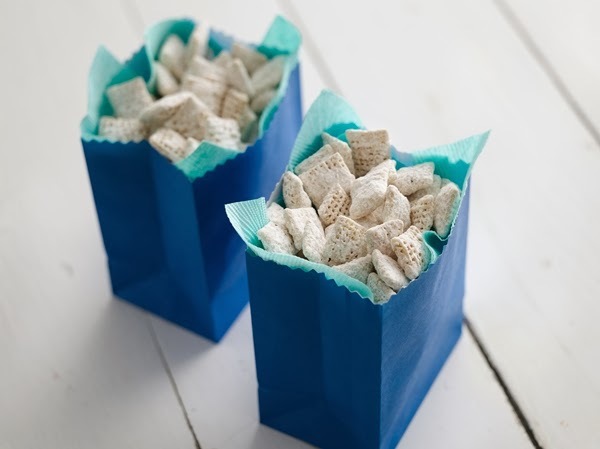 My kids love puppy chow made from regular Chex. I'll have to try this recipe!